You are currently browsing the tag archive for the ‘Francis L. Cohen’ tag. 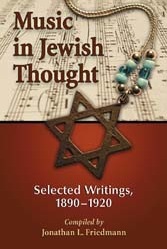 Although the study of Jewish music as a scholarly discipline is still comparatively recent, the publication of two anthologies of older musical thought highlights how the field has matured. The first work is a collection of essays written between the death of Salomon Sulzer (1804–1890), the cantor-composer “rejuvenator” of Ashkenazic synagogue music, and the emergence after World War I of Abraham Z. Idelsohn (1882–1938), the first academically recognized musicologist and ethnomusicologist of Jewish music. What Sulzer and Idelsohn shared in common, according to Friedmann, was a romantic notion of Judaism’s musical past. Just as Sulzer strove “to discover and present ‘purified’ [Ashkenazic] Jewish music” (8), so Idelsohn sought “to uncover unifying elements contained in the music of all Jewish communities, no matter how disparate” (15). The achievements of both engendered a sense of pride in the continuity of Judaism’s religious and cultural past and the Jewish people’s place in the post-Emancipation present.